The oil rig that exploded and sank into the Gulf of Mexico a week ago continues to spew 42,000 gallons of crude oil a day from the broken well head on the ocean floor. Engineers with BP, the company that was leasing the rig, have been unable to activate a containment system that would remotely cap the well, and alternative solutions appear to be days if not weeks away. 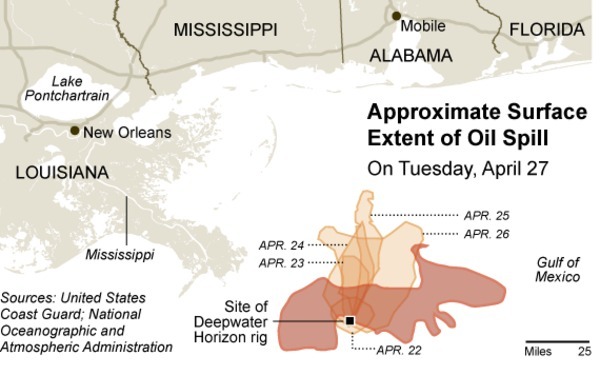 Meanwhile, the oil slick continues its steady movement north and threatens to make landfall along the Gulf coasts of four states within the next few days. Louisiana has set up protective booms around particularly sensitive wildlife habitat, hoping to stave off the worst of the oil’s effects on nesting waterbirds. But concern is growing over the impacts on fish and filter-feeding organisms like oysters. The Coast Guard is now considering a controlled burn where the surface oil slick is contained within a “fire boom” and then set alight, burning off up to 95 percent of the oil. The process does leave a petroleum residue behind that can then sink to the ocean floor, and the smoke generated by the burn is full of toxic chemicals and particulate matter, but the risk of exposing marine birds and other organisms to the oil slick itself is considered more immediate. 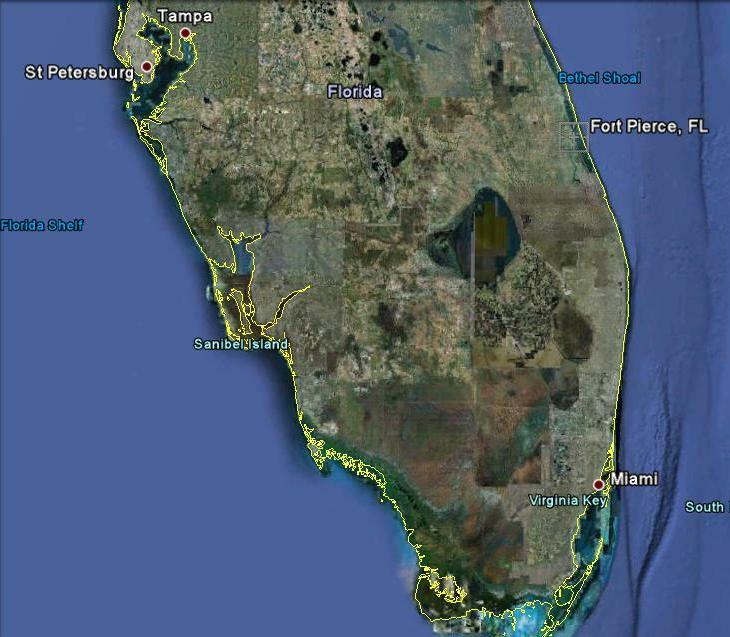 The SEANET blogger finds this situation deeply disheartening, and wonders what it will mean for the future of offshore oil drilling. It does not appear that adequate safeguards or remedies are in place to prevent or correct catastrophic failures like this one, and the thought of that volume of oil flowing unchecked into the ocean day after day is enough to lead one to despair. SEANET hopes for some good news soon. 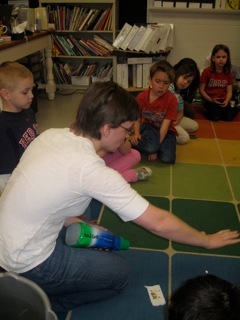 Last week, the SEANET blogger visited Mrs. Dohrmann’s 1st grade class in East Kingston, NH. The students are raising ducklings and learning about the environment, so SEANET was a great fit for them. Your blogger brought a host of intriguing objects, including severed seabird wings and heads, and a pile of the plastic fragments recovered from the stomachs of Greater Shearwaters. The first graders were remarkably astute and knowledgeable about the problem of plastics in the oceans and how it affects seabirds and marine life generally. They even knew how plastic bag ingestion has caused the deaths of countless sea turtles because the animals think the bags are prey items like jellies. Unlike many adults the SEANET blogger meets, the kids were incredibly excited about the prospect of holding a gannet’s head, or a stuffed dovekie. The blogger was most impressed with the kids, and very encouraged by their commitment to preserving the environment. Mrs. Dohrmann, you should be very proud–they are an absolutely delightful group! Polar Bears on a collision course with seabirds? As if Murres don't have enough to worry about: Polar Bears?! A new study in the journal Polar Biology has described seemingly unprecedented predation on seabirds by an unusual perpetrator: the Polar Bear. Poster child for the plight of all Arctic animals as climate change melts the polar ice, the bears usually rely almost solely on seals for sustenance. When the ice breaks up every Spring, the bears usually enter a prolonged fast, consuming very few terrestrial organisms and relying on stored fat for survival. In Hudson Bay, scientists have documented progressively earlier ice break up, meaning longer and longer fasts for the bears. Historically, Arctic seabirds have had little to fear from Polar Bears since the bears were still feeding on seals out on the ice during the birds’ nesting periods. By the time the bears were driven onto land, the young birds had already fledged and were out of danger. Now that the bears are coming onto land earlier, their arrival coincides with seabird nesting. In a spectacular slideshow, the scientists show the bears scaling almost vertical cliffs to feed on murre chicks and eggs. Locally, one bear can completely decimate a seabird population. It is still unclear if this will become an Arctic-wide phenomenon threatening seabird survival. 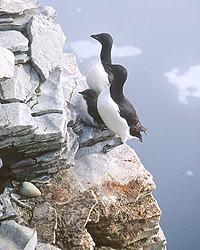 Also unknown is whether the seabirds may somehow adapt to warming temperatures by altering their nesting periods. So far, the birds are lagging behind shifting temperatures, leading to food scarcity for their chicks. With that uplifting story, the SEANET blogger wishes you all a Happy Earth Day. SEANET blogger, Sarah Courchesne, took off for Buzzard’s Bay in Massachusetts this past weekend. She dragged her husband and two kids along for a visit to the Lloyd Center for the Environment in Dartmouth, MA. 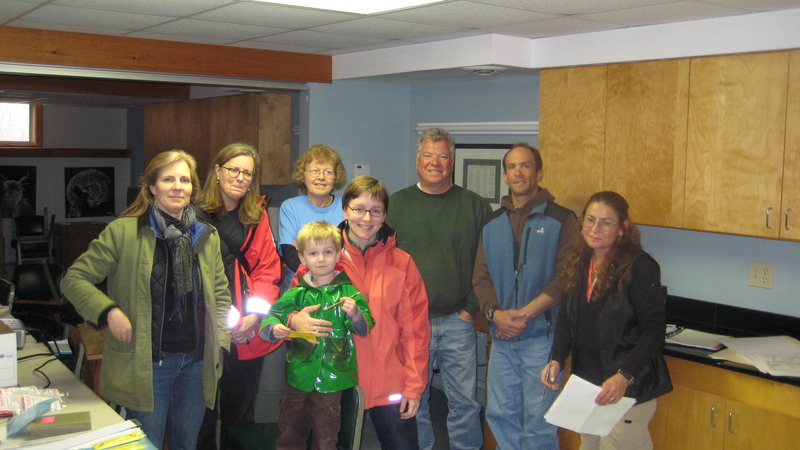 A handful of our very best Seanetters from the area gathered for an informal update on some SEANET data and methods. The blogger was most impressed with the gorgeous setting and only wished the weather had cooperated with host Jamie Bogart’s plan for a group beach walk. Guess that just means another trip down is in order in the future. It was a pleasure to meet this particular group since many of them have been with SEANET nearly since its inception! SEANET thanks Jamie for hosting the group, and for continuing to keep morale high among his cadre of Seanetters. Thanks to all who attended, especially for putting up with the kids I brought along! Wildlife officials in Fort Pierce, FL suspect that 15 dead pelicans found in a pile at the Taylor Creek Spillway may have been deliberately poisoned. It is not clear if this theory is based on necropsy findings or other testing, but officials say the deaths were not natural. There was no evidence of gunshot or other trauma on the birds, and it is unclear whether the birds died together at the site or were transported from another location and dumped. All of the birds appear to have been dead up to a few days. The SEANET blogger, for her part, is troubled by the discovery of so many dead pelicans all together, but questions the basis for the poisoning theory. Absent any necropsy results or other testing, it sounds like pure speculation at this point. In a previous post on this blog, a pile of dead pelicans in Alabama had succumbed to a severe cold snap and died huddled together. Certainly, it has not been quite that cold in Florida in the past days, but the SEANET blogger only wishes to point out that there is more than one way for a pile of dead pelicans to appear. State officials are hoping someone out there might have seen something or have some explanation for the pelicans’ deaths. They ask that anyone with information call the State Fish and Wildlife Conservation Commission. Their number is 888-404-FWCC. They report that there may be a reward. Calling all once and future Seanetters in Rhode Island/southeastern Massachusetts! SEANET will be holding a hybrid presentation/informational talk/training session. All current volunteers, lapsed volunteers looking to rejoin the fold, and newbies interested in joining are welcome. Even if volunteering with us is not for you, please join us to learn about our efforts and the sorts of data we’re collecting. The SEANET blogger will be giving the presentation, which will blow her cover and reveal her very top secret identity. SEANET Director, Dr. Julie Ellis, will not be in attendance, and is foolishly entrusting SEANET’s public image to the blogger. The presentation will be held at the Lloyd Center in Dartmouth, MA on Saturday, April 17th. The indoor portion of the event will start at 9am, and after the presentation, weather permitting, we will go on a beach walk to get the full SEANET experience. Dead birds have been invited to attend, but no RSVPs have been received as yet. The SEANET blogger is looking forward to meeting some of our most dedicated and long-standing volunteers. Look to the blog next week for embarrassing photos of them all! Since the SEANET blog has now been renamed “The Ray Bosse Show,” today’s post will reflect our new focus on all Ray Bosse, all the time. Last week, your SEANET blogger reported on Ray’s 100th (really 60th or so) dead bird. The carcass found on that now-not-so-momentous day was that of a female Common Eider. Ray reported the band, and the info is in: this adult female Common Eider was banded on May 20, 2009 on Orrs Island in Casco Bay, Maine. Brad Allen (right) with a banded eider near Orrs Island, Maine. The researcher who banded the bird is Brad Allen, Bird Group Leader for the Maine Department of Inland Fisheries and Wildlife. Anytime a banded Common Eider turns up in SEANET territory, you can be just about sure that Brad banded it. We asked him for some information on his research’s scope and purpose, and he very obligingly provided it. 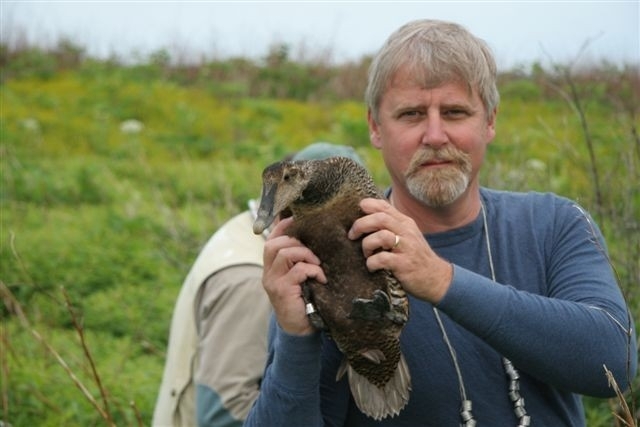 While previous banding studies focused on female eiders captured on the nest, Brad and his team have devised a technique that allows them to capture male eiders as well, by targeting them while they are molting, and therefore flightless, out on the water. Nearly 5,000 males have been banded to date, allowing survival estimates to be made for both sexes, and since hunters preferentially target males, getting males banded is crucial to understanding the magnitude of hunting pressures on the eider population. 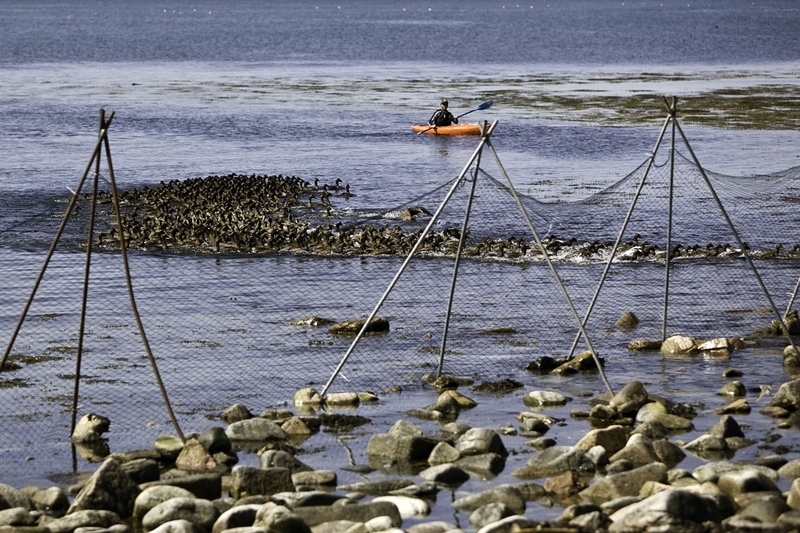 Eiders being rounded up for banding. The technique works so well, Brad has to let half go without banding them! That’s it for today’s edition of the Ray Bosse show. The SEANET blog will return with it’s usual sort of programming next week. Unless Ray does something else warranting recognition between now and then. Not an unlikely prospect, at this rate.